I play a ton of Ascension, a card-based deck building game. I own the first core set and expansion and while I enjoy it, the digital experience is a lot easier to manage. Unfortunately as of this writing the Ascension app is only available for iOS. I backed the Android and Windows Kickstarter project, and hopefully we’ll see an Android version in the fall. In the meantime, I’ve played over 600 games with Bert on his iPad Mini, and Sedagive? and I played a just a touch over a hundred before I returned my former employer’s iPad to them. I’m back into the world of iOS in my new job, and so I’ve got my own iPad Mini now. Anyway, at some point we started tracking our games. Bert just takes a screenshot and manually adds the stats up over time. I kept a spreadsheet on Google Drive, but still tapped in the results after every game. It was a little unwieldy. When I got my own iPad Mini I thought there could be a better way. 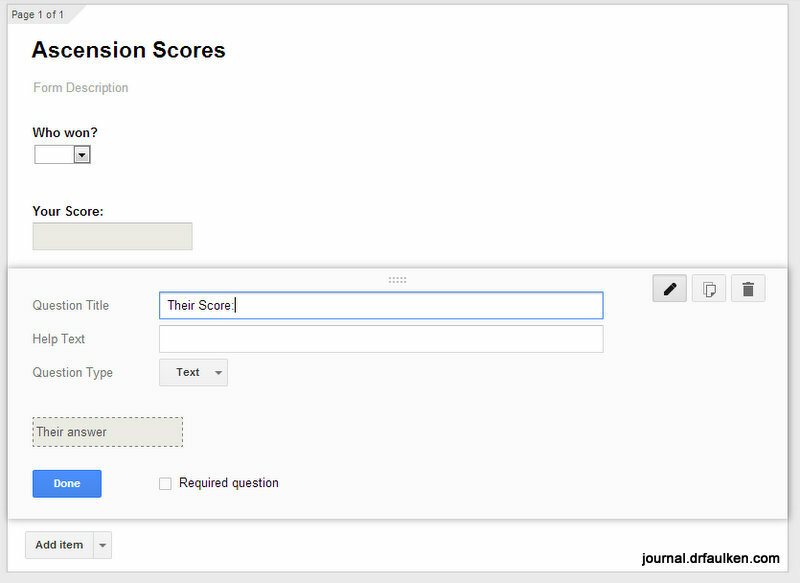 Here’s how I use Google Forms to keep track of our Ascension scores. Choose your theme. This is the most important step. Also, give your form a name. Also kinda important. Type in your first question: who won? The question type is choose from a list. Next up: the first player’s score. Title this question [first player] score, where [first player] is the name of the, uh, first player you entered in the previous step. You want to make sure the question type is text. Add the second player’s score. Again, the question type should be text. 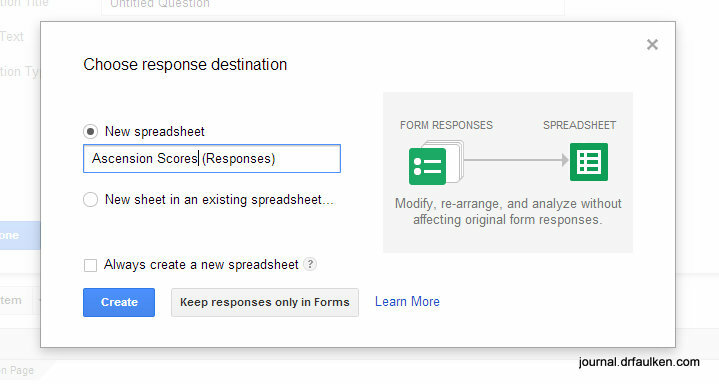 Google Forms will automatically suggest the name for your results spreadsheet. Unless you want to get fancy, just click Create. 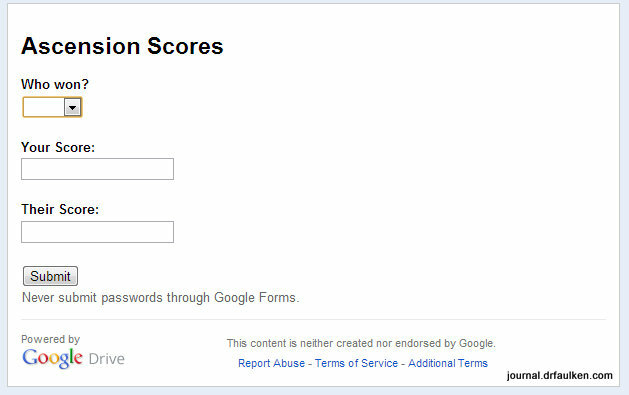 This is what your form looks like: go ahead and enter some dummy data. I’m going to show you how to add up the total number of victories per player as well as the total number of points scored. Okay, open your results spreadsheet in Google Drive. 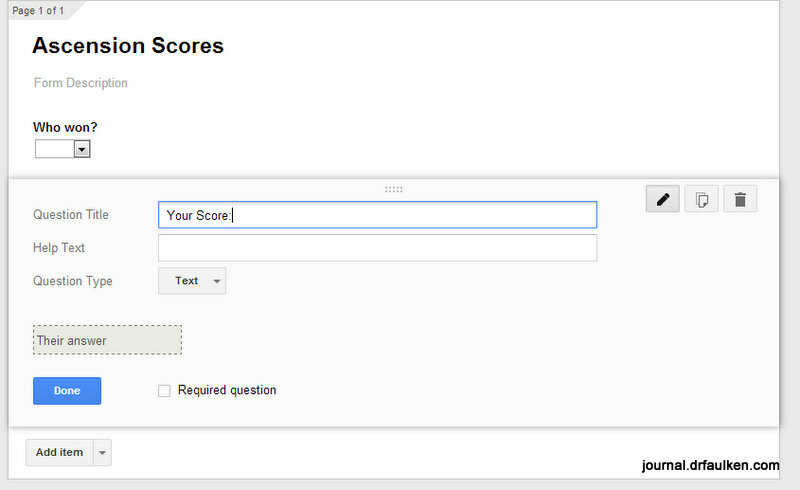 Add two rows above the test data you entered. In the first row, type “Total Victories” in the first column. In the second row, type “Total Points” in the first column. Please adjust “You” to Player 1’s name. Please adjust “Them” to Player 1’s name. 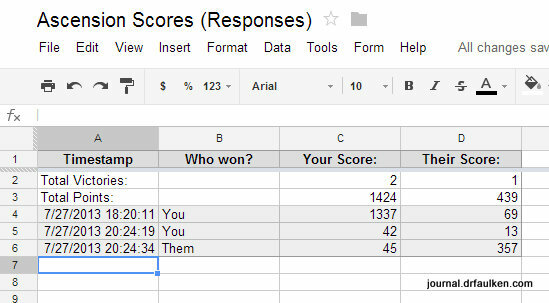 This adds up all the points for Player 1 after the spreadsheet’s header and the rows with the two totals. This adds up all the points for Player 2 after the spreadsheet’s header and the rows with the two totals. At some point you will have to edit the range for the point totals. 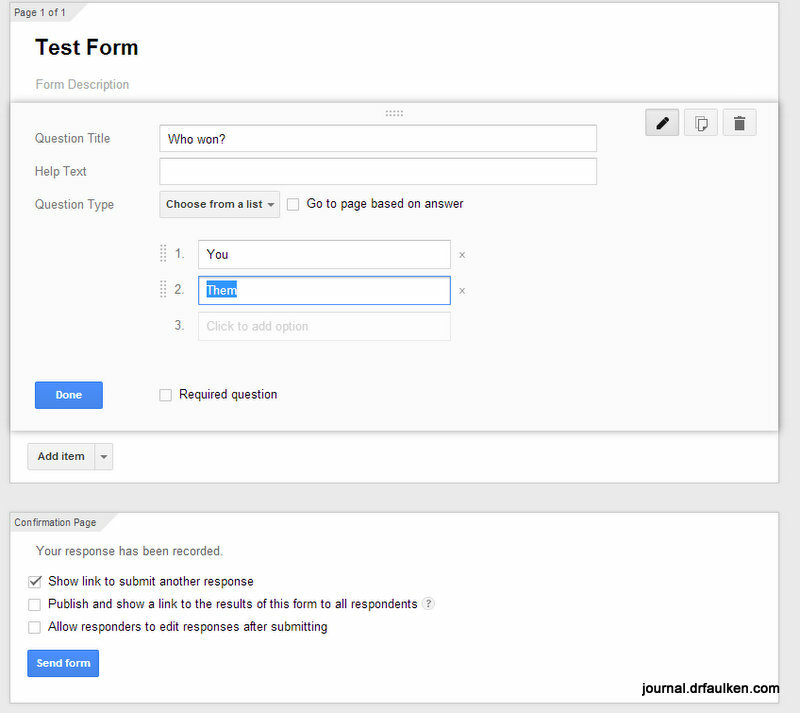 You can get the URL for your form by clicking the blue “Send Form” button in Google Forms. 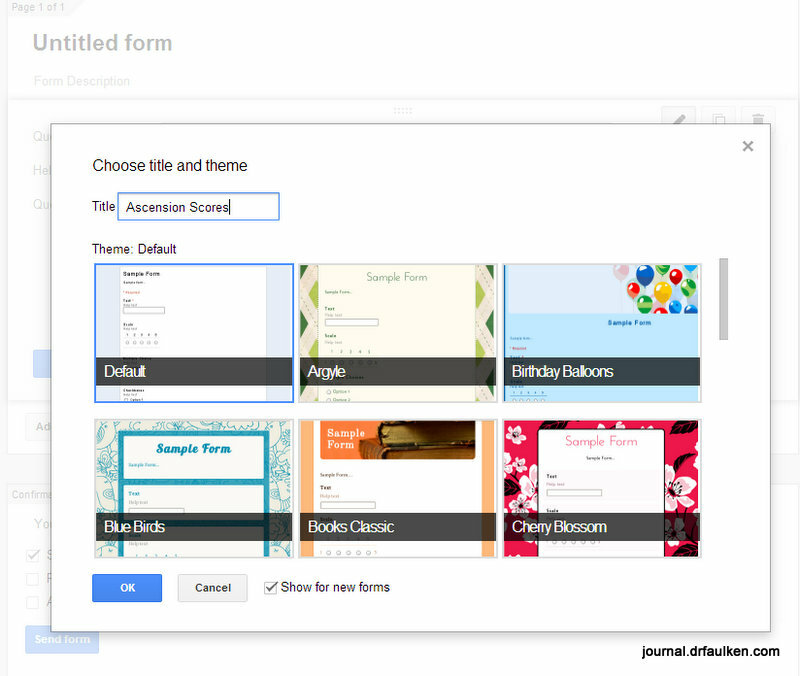 There are various sharing options as well as the direct link to the form. I bookmarked ours. Hopefully this took longer to read than it did to set up your own point tracking system. From here you can derive some nerdy stats, such as the greatest margin of victory, highest and lowest scores, winning streaks, etc.